So not only can you take a bus from Pearl's to the Rockaways for only six dollars, you can enjoy the pizza comforts of home once you get there. 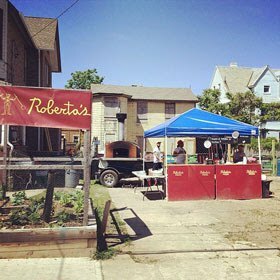 According to their newsletter, Roberta's has officially opened up their pizza stand in the Rockaways. Grab a pie on 96th street, then go to the beach and don't get arrested for drinking all that beer you brought. Yay summer pizza!! !